The houses go on sale on Friday at noon. People queuing overnight in the rain to secure a house in Dublin 15. A LARGE GROUP of people are currently sitting in the pouring rain in a bid to secure a deposit on a home in Dublin 15. 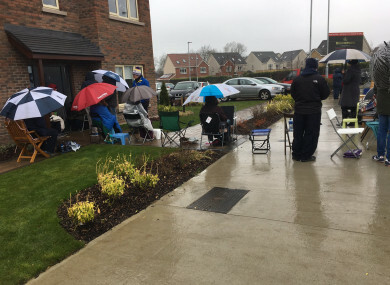 Would-be house buyers started queuing at 6am on Monday morning to reserve a house in the new Beechwood development on the outskirts of Clonsilla. The 24 three- and four-bed houses go on sale on Friday at noon. The price of the homes range from between €300,000 to €500,000 and the small crowd of people are stationed outside the sales office. Prospective buyers will be asked to put down a refundable deposit of €2,000 to proceed with a purchase. Those queuing have come equipped with chairs, deck chairs, umbrellas, blankets, warm clothes, rain jackets and other supplies. However, those waiting have not been handed a ticket guaranteeing their place, which is often regular practice for many new builds when there is demand. Instead, they are operating an honour system – with each person getting to know those waiting either side of them who can vouch for their position. TheJournal.ie spoke to a number of people, most of whom didn’t wish to be named, about the process of waiting. One man, who is waiting to put down a deposit for himself and his girlfriend, said this is the way things are now. The estate agency selling the properties, Kelly Walsh, is making no comment at this time. The scenes at Beechwood Gate are reminiscent of those during the property boom of the Celtic Tiger-era which saw people queue up for developments in places such as Adamstown, Ireland’s first ghost town. This isn’t the first example of it though. Last year, the Irish Times reported that people stayed in line overnight to snap up properties at Kilternan development, Bishops Gate, which was being sold by the same property advisors Kelly Walsh. Email “People have been queuing in the rain for houses in Dublin since Monday morning - they go on sale on Friday”. Feedback on “People have been queuing in the rain for houses in Dublin since Monday morning - they go on sale on Friday”.